Col. Heath Collins, formerly senior materiel leader and system program manager for the Ground Based Strategic Deterrent Systems Program Office at the U.S. Air Force‘s Nuclear Weapons Center, has been assigned as program executive officer for fighters and bombers at Wright-Patterson Air Force Base. Gen. David Goldfein, Air Force chief of staff, announced Collins’ new assignment in a Defense Department press release published Thursday. Collins, who joined the service branch in 1993, managed the program office responsible for the procurement of GBSD intercontinental ballistic missile technology for nearly two years. 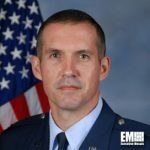 He previously served as deputy director for remote sensing systems at the Los Angeles-based Space and Missile Systems Center and helped procure the Air Force’s space-based missile warning, defense, battlespace, intelligence and weather monitoring systems. He also led the Defense Department‘s airborne intelligence, surveillance and reconnaissance, space and special programs during his stint at the Office of the Under Secretary of Defense for Intelligence. Collins earned master’s degrees from National Defense University, Air University and Florida State University.